L-Arginine has been popular in the medical community for the past 30-40 years. It has been touted and highlighted in several medical journals as far back as the 1970s. It's primarily used to help increase human growth hormone production and improve blood flow to tissues throughout the body. It's also well known for it's sexual enhancement benefits for both men and women. 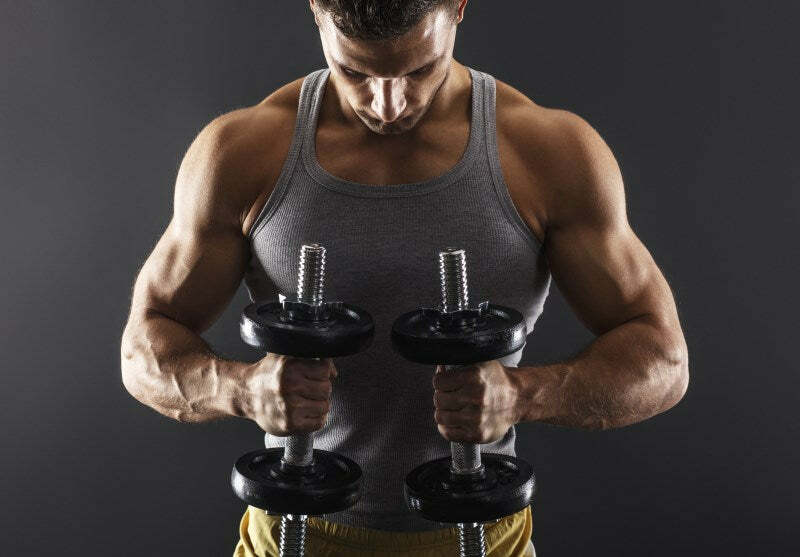 While nitric oxide is increasingly becoming one of the most popular bodybuilding supplements today, the use of arginine is also being investigated as a co-supplement that can be taken in conjunction with NO. There is a collective misunderstanding among bodybuilders that nitric oxide is a hormone when it is actually an amino acid that may double and act like a hormone when impacting the human body. Arginine is also an amino acid which is necessary in order for an individual to manufacture NO. Remember that nitric oxide is a messenger molecule that allows cells to communicate with each other while facilitating the flow of blood to muscles by dilating veins and arteries. NO (nitric oxide) could not be created if there was an absence of arginine in the human body. It also assists in the manufacturing of important chemical compounds such as L-glutamate and creatine, which can both be transformed into glycogen and glucose for energy when necessary. People take arginine to improve heart conditions, erectile dysfunction and accelerate wound healing, but bodybuilders are now finding that taking a nitric oxide supplement along with arginine supplements will enhance the effects of the nitric oxide and produce results which in some cases are dramatically improved just by taking a NO supplement. Besides being involved in protein creation, arginine is also a growth hormone. Its success as a growth hormone stimulator, however, is somewhat irregular because of individual factors involved in the outcome. It has also been established that the effects of arginine is reduced in people over the age of forty. It appears that you can better sustain the beneficial influence of arginine by taking it for a short period time (around three to four weeks) before taking a two-week break from it, then begin the four week period of taking it daily. One thing you have to watch when taking arginine and nitric oxide supplements together is the sort of food you eat. Food which causes other, different amino acids to proliferate in the bloodstream will reduce the ability for arginine to interact effectively with nitric oxide and release the growth hormone which builds that bulk and muscle mass bodybuilders work so hard to generate. So remember to take arginine (and NO) on an empty stomach and allow enough time for your body to absorb the pills before working out. A period of about two hours is a good amount of time to wait. Doctors want to caution that arginine?s effectiveness as a growth hormone works best on someone who is in their 20?s and 30?s. After 40, arginine produces an insignificant release of growth hormone and mainly contributes to the maintenance of a healthy cardiovascular system but not to the growth of muscles. Take arginine and nitric oxide on an empty stomach and allow enough time for your body to absorb the pills before working out. As a side note, arginine has also been used as a treatment for erectile dysfunction because it stimulates the function of NO by easing muscle tension which constricts blood vessels that help maintain an erection. In addition, if you find that you begin suffering from indigestion or heartburn from taking nitric oxide supplements, you will want to reduce your dosage to see if you may be taking too much arginine, since this amino acid tends to stimulate the production of stomach acid by increasing the release of gastrin, a hormone which exacerbates the amount of stomach acid coating the inner lining of your stomach. Severe burns, infections, and injuries can deplete the body's supply of arginine. Under these conditions, L-arginine becomes essential and it is necessary to ensure proper intake to meet the increased demands. L-arginine is also essential for children with rare genetic disorders that impair the formation of L-arginine. L-arginine may lower blood pressure because it is involved in the formation of nitric oxide. It may also result in indigestion, nausea, and headache. L-arginine should not be used following a heart attack. If you have a history of heart disease, consult your doctor before taking L-arginine. It may also alter potassium levels, especially in people with liver disease. People with kidney disease and those who take ACE inhibitors or potassium-sparing diuretics should not use supplemental L-arginine unless they are under professional supervision. Arginine may also alter the levels of other chemicals and electrolytes in the body, such as chloride, sodium, and phosphate. It is also possible for arginine to increase blood sugar levels, so it shouldn't be used by people with diabetes unless under a doctor's supervision. Pregnant and nursing women and children should not use supplemental L-arginine, as it's safety has not been established. People with genital herpes should not take L-arginine because it may aggravate their symptoms. L-arginine may counteract the benefits of lysine to treat herpes. Also, NSAIDS (non-steroidal anti-inflammatories) or other drugs that are hard on the stomach should not be combined with L-arginine.